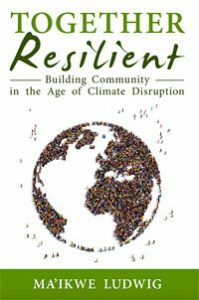 This post is an excerpt from Together Resilient: Building Community in the Age of Climate Disruption by Ma’ikwe Ludwig, published by The Fellowship for Intentional Community. Visit our fundraising campaign to learn how you can support the publication of the book and get yourself a copy! Food is one of the true universals: everyone eats. Most of us have familial and cultural associations with food, and we have developed an incredible range of ways to get our food needs met (both technologically and in terms of the contents of our diets). This makes food rich and interesting territory for sharing, which is pretty handy since, several times a day, most of us need to put some energy into feeding ourselves. So why not share labor and resources, reduce our time spent prepping food, and tap into that richness that emerges almost immediately when we get other people involved with our food scene? This quote gets at one of the underestimated benefits of meal sharing: assuming you aren’t driving long distances to meet your food buddies, it saves a lot of energy as well as the accompanying carbon emissions. In addition to only having the lights running in one place, it also takes less fuel to make the food. Cooking one bigger pot of beans for 20 people simply takes less gas or electricity than the same number of people cooking 6 smaller pots of beans. It also saves time overall: one cook spending three hours to make a meal for those 20 people is better than 6 cooks each spending an hour. Two other benefits of meal sharing: 1) we are able to get a chunk of our social needs met doing something we’d have to do anyway. Food in America is often a pretty isolating experience. The worst is when we go through a drive through and then eat in the car on the way somewhere, but a surprisingly large % of our meals are eaten alone. (A study by the Hartman Group, reported on NPR, indicates that 46% of “adult eating occasions” are done solo, including about 1⁄4 of our dinners.) In short, it is easier to love cooking when it isn’t quite such a daily drudgery. If you meal share even twice a week, that means two night a week where all you have to do is show up most of the time and you can have a lovingly cooked meal ready for the eating and sharing. Then when it is your turn, you can take the time to offer it to your friends as an act of love. • Find 2-6 other people or families who want to participate. This is enough people to be able to get at least some labor sharing benefits, but not so many that most people’s houses can’t accommodate the group. If only one person has a big enough space, then work out an agreement that works for everyone for their place to be the eating hub. • Choose people that are either within walking or biking distance of each other or on the way to (or from) other places you drive anyway. • Make some simple agreements about what things can be served (and have to be served) in order for the meals to work well for the members. This may mean things like there always needing to be a vegetarian protein option, and avoiding things people are allergic to. • Rotate cooking. If not everyone loves to cook, they can be on clean-up duty. 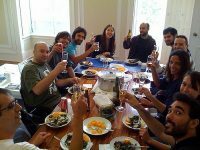 If not everyone feels confident in cooking for a group, offer to have buddies at the start until people gain the confidence to be able to cook. If you have a big enough pool of cooks, you can actually cook in pairs all the time if you like. • Make leftovers agreements and bring your own containers from home. • Consider having collective equipment that can go to whomever is cooking next. A big crock pot, a hay box, large pots and pans and an electric coffee urn are all examples of things a single person or family might now own, but are very useful when cooking for bigger groups. • Finally, consider how you can use your meal sharing to organize for deeper change: watch a political movie together once a month and talk, use this as a first step in starting a community, encourage people to bring petitions or announcements of actions happening in the area, or simply invite deeper conversation than is normal for our culture, thereby becoming a part of each others real support networks. It’s best to not make every meal political, but there’s no sense wasting a perfectly good platform to take things deeper. Variations on the standard theme of this meal sharing system I describe above include hosting an underground restaurant (if one of your friends loves cooking for big groups a lot, this could be a good alternative: they cook, and everyone else pays for the ingredients and leaves tips for the cook, leaving the cook to eat for free) or doing a cooking swap where each person cooks a meal that can be easily frozen for everyone else and you meet once a week to trade meals you’ve prepared for each other. This gets less of your social needs met, but has many of the other advantages. Like this excerpt? Visit our crowdfunding campaign to get your copy of Together Resilient before the book’s official release date!